Life's a salad. Eat it up. If I gave instructions that followed my path to making these bars it would begin: Plant several kinds of bananas. Nourish them. When the bunch has matured, cut it down. 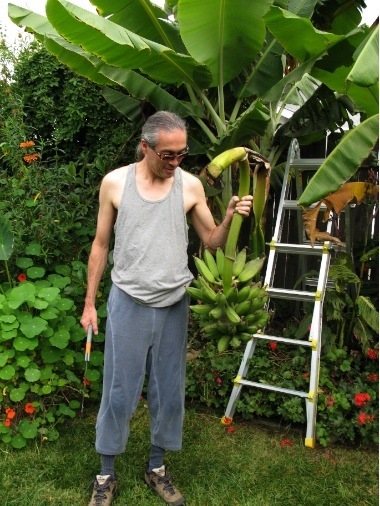 While waiting for the bananas to ripen off the plant, one can make a salad or banana flower curry from the flower that hangs below the banana bunch. 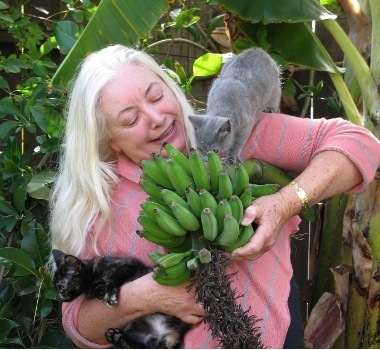 You can make a hair rinse, Bali style, from the rising sap of the fresh cut banana plant. 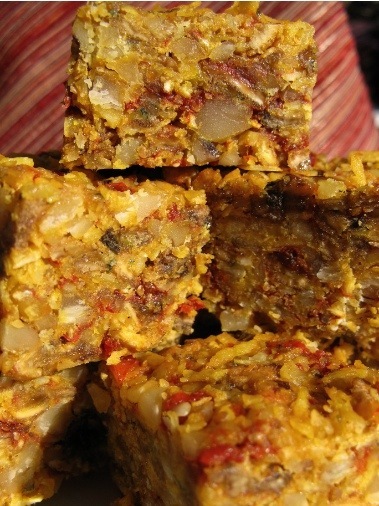 I know, I know, you just want a quick and delicious raw snack! Well, here it is, and it IS quick and delicious. For those of you with banana plants, I've tried this with Brazilian bananas (light and strawberry tasting) as well as the regular Cavandish variety. For this bar, the Cavandish is better. More meaty and chewy when dehydrated. 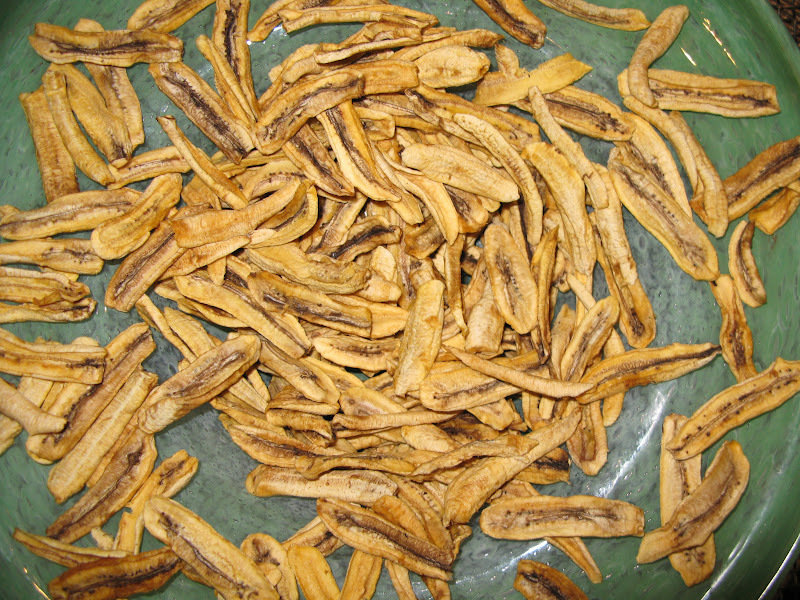 Yes, the recipe begins with dehydrated bananas, so you can buy a package (Cavandish is the commercial variety you will find in stores) or dehydrate a few bananas at 105 degrees if you have a dehydrator. 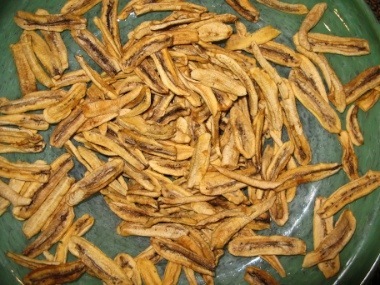 This photo is of a bunch of the little thumb sized Brazilian bananas we harvested recently. Our plants are buffeted by the western winds from the Pacific and the Eastern wind from the desert so the skin looks quite scruffy but this does not affect the interior. Commercial bananas are bagged on the "tree" as they grow so they look cosmetically nicer. (It's not really a tree. The banana plant is the largest herbaceous flowering plant). They take time to ripen and do so in seemingly random patterns. 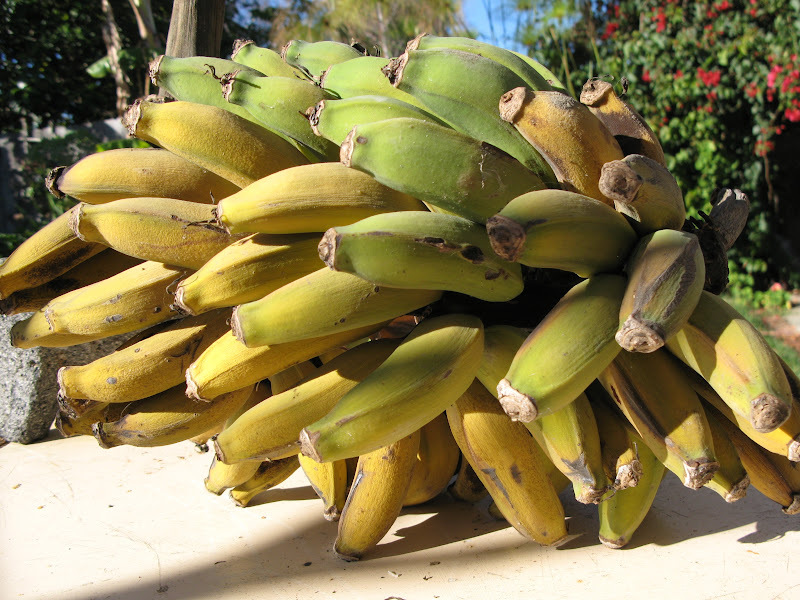 The word banana comes from the Arabic banan which means "finger". The bananas are peeled, cut and arranged on teflex sheets to go into the dehydrator. I didn't dehydrate these as hard and chewy as I could have. For these sorts of jobs I put on my favourite music or podcast or downloaded TV show. The fastest way I've found to make the pieces small is to snip them with scissors. (It's also an opportunity for a meditation in action). Amounts? Think about creating a balance with the banana pieces. It's hard to go wrong. Add warm (not hot) water to the goji berries. While they are soaking chop the nuts and add them to the bananas. Add the coconut angel's hairs(can't you just see a coconut angel with long coconut strand hair? ), hemp seeds and coconut butter if you are adding a little. 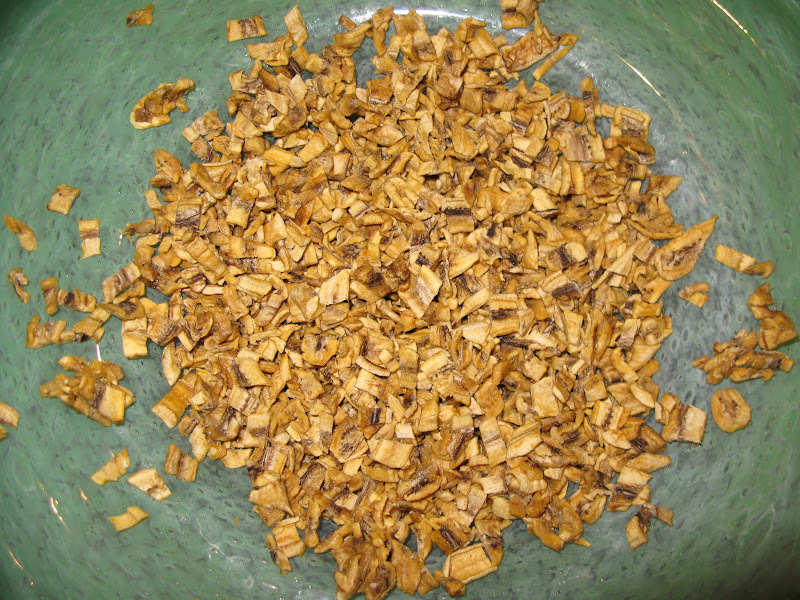 (The reason for adding more cacao butter than coconut butter is that the cacao butter has a higher melting point and so will hold the mixture together better at room temperature). It also tastes delicious. 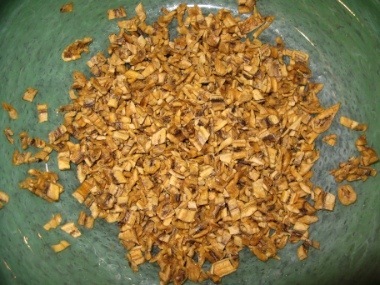 By the time you've finished chopping and adding everything else except the cacao butter the goji berries will be ready. (You can also soak them for several hours). Pat the goji berries somewhat dry, chop and add them to the mix. Stir well. 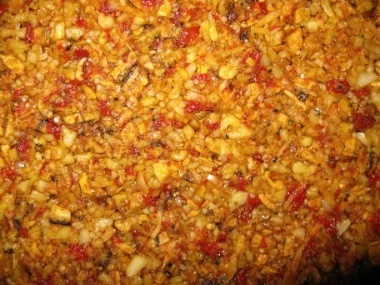 The goji berries will give the mix a golden glow. As I stir I wonder if they would make a good dye for thin silk. I am also reminded to plant some as the leaves of goji are good in green smoothies. I'm curious to know your decisions about creating balance with these ingredients. Looking at the size of your batch, choose a pot to gently melt the cacao butter which will also hold all of the ingredients as you stir the cacao butter into everything, coating each piece. The cacao butter will both flavour the mixture and hold it together. Also choose a container to put the mixture in. It should fit in a spot in your freezer or refrigerator. Spread a thin layer of coconut butter on the inside of the pan or glass container so it will be ready when you have stirred in the cacao butter. GENTLY heat. This will go slowly but you don't want it so hot it sizzles your raw ingredients. Cutting the cacao butter into pieces before you melt it will make this part a little faster and easier. Once the mixture has been completely coated in cacao butter, turn the mixture into the oiled container. Use a spice bottle as a tamper to compact everything into a block. When you have a well compacted, flat surfaced block, cover with a clean kitchen towel or a loose lid and put it in the freezer or refrigerator. When it has set a little (it doesn't need to be frozen hard) bring it back out and cut into squares or bar shapes. Enjoy! Your bar will be better tasting and cheaper than the energy bars you buy. No cook, raw living food goodness. When artist Alex Gorlizki saw a photo of these he said "I'm sure these are downloadable if I just press the right keys while licking the mouse.."
I hope you check out Alex's work while munching your WuBe bars. 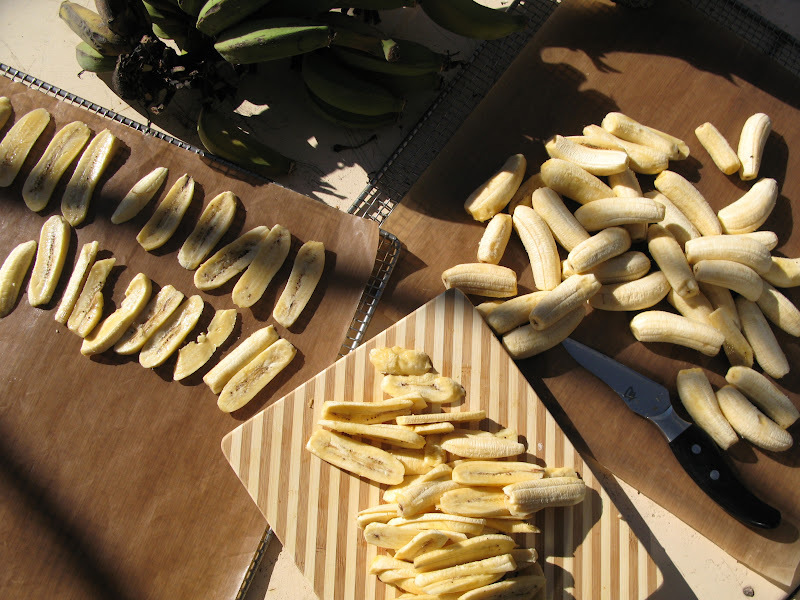 Bananas contain considerable amounts of vitamin B6, vitamin C and potassium. 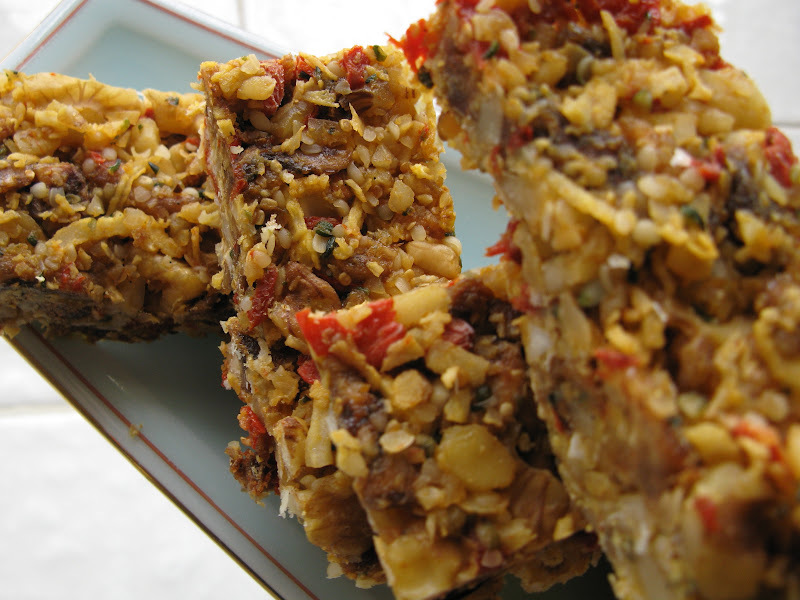 This is why they are particularly good in energy bars. Replenish your electrolytes! Silani is a raw food chef, urban farmer and movement therapist living in Ventura California. Saffron Coconut Kefir.....A Valentine delight.